We now took a detour to the fabled Sherwood Forest. 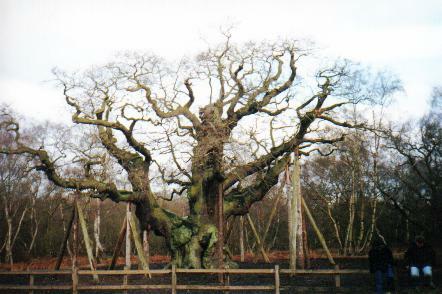 Sherwood Forest was a little different to what was portrayed in the Kevin Costner movie and I was saddened a little to see how humans had yet again destroyed a piece of history and legend. 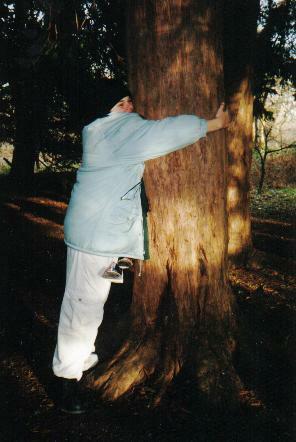 The tree's in the forest were not tall towering behemoths but rather shorter and sparse - though there were sections that did hold this value. It is good to see however, that some efforts have been made to restore this forest and protect what is left. Major Oak - or whats left of it. The meeting place of Robin, Little John and his other Merry Men. Because of tourists and a number of other things plus the sheer age of it - this tree is now only standing because of supports. 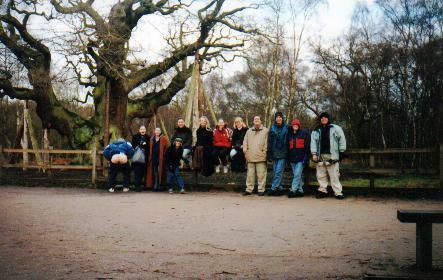 A repeat of Stonehenge can be seen - with people thinking it is amusing to carve their initials into the tree. 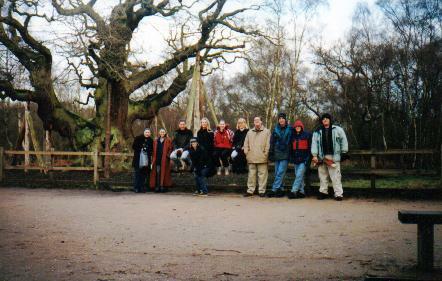 Contiki Group at Major Oak, 15.01.00 A.D. The solitary tree of Major Oak, a last testament to the tale of Robin Hood. Here is one of the very few areas to which the forest is dark, tall and gloomy, and I love it and even had a treegasm with this tree. Note: the bowling shoes. Most know the tale of Robin Hood and his Merry Men but here is a brief summary of this tale. This is but one variation of the story to which I dont proclaim is the right version. Other versions have been adulterated by Hollywood and fiction - but this above story is the basic outline and holds elements that all of the tales hold. This like the Arthurian legend, holds a factual element, though there is not a lot of historical evidence to back it up. Though, it is very likely that such revolts did happen.